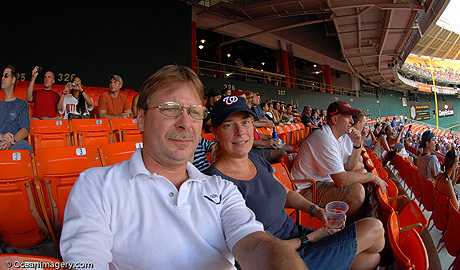 Me and Julie at the Nats Game, RFK Stadium (10.5mm fisheye lens)As a general rule, I’m not a big baseball fan! I think the game by nature is much too slow and I find it very difficult to keep myself interested long enough to see a great play or a home run. My game is ice hockey! It’s a fast game that takes great skill and always keeps you on the edge of your seat. If i’m not playing hockey you can usually find me watching it. Now that I think about it, I can’t remember ever going to a baseball game before…!? During our Engagement Party back in June, our good friends Jill and Francis, gave Julie and I some tickets to see a Washington Nationals baseball game as an engagement present. Francis goes to the games often and is always commenting on how much fun they are so I jumped at the offer. Knowing that I had never been to a Nat’s game before, I thought it would be a great escape for us since we had been so busy with all the wedding planning stuff. Thanks again for the tickets you guys… we really had a blast! !